NEW YORK, NEW YORK (May 16, 2018) — In continuation of its year-long 30th anniversary celebration, the Young People’s Chorus of New York City® (YPC) makes its debut at the world’s largest Gothic cathedral, the Cathedral of St. John the Divine, on Saturday, June 2 at 7:30 p.m.
Tickets priced $30 (general admission) are on sale now online or in-person at the Cathedral of St. John the Divine (1047 Amsterdam Avenue at 112th Street). VIP tickets are priced $130. This spring performance, co-presented by YPC and the Cathedral, brings together more than 425 choristers from all of YPC’s choral divisions, with girls and boys from 8 to 18 years of age singing in a variety of different choral configurations. Led by YPC Founder and Artistic Director Francisco J. Núñez and Associate Artistic Director Elizabeth Núñez, the choristers perform repertoire that exemplifies their versatility and virtuosity, from classical and contemporary compositions to Broadway, spiritual, folk, and popular music. Among the featured works are pieces by Rossini and Rimsky-Korsakov; the world premiere of a new YPC commission, “No one is an Island” by Nils Vigeland; contemporary works by frequent YPC collaborators Meredith Monk and Jim Papoulis; traditional Argentinian, Guatamalan, and Native American music; selections from The Lion King; and Francisco J. Núñez’s “Ah! Vous dirai-je, Maman,” which he conducted in its world premiere last summer at YPC’s Mostly Mozart Festival debut. This challenging, multicultural repertoire reflects YPC’s commitment to diversity and artistic excellence. The chorus has performed on four continents, has won over a dozen gold medals in international choral competitions, and has invigorated the repertoire for young voices by commissioning and premiering over 100 compositions from today’s most distinguished composers. Following this spring performance, YPC’s summer schedule includes tours to Canada and Japan; a return to the Mostly Mozart Festival for performances of Leonard Bernstein’s MASS; and performances at the International Festival of Arts & Ideas in New Haven and Merkin Concert Hall in New York in collaboration with the Yale Choral Artists. 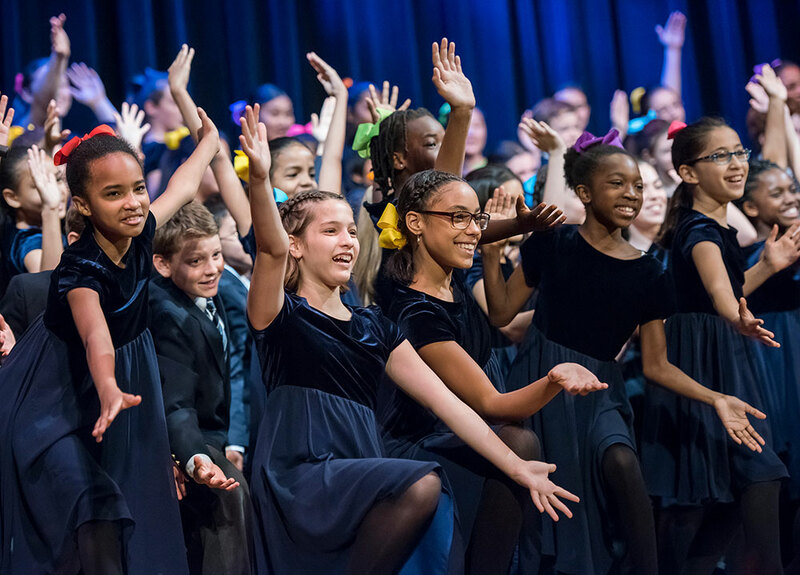 The Young People’s Chorus of New York City is a world-renowned youth chorus founded in 1988 on a mission of diversity, artistic excellence, and education by Artistic Director Francisco J. Núñez, a MacArthur Fellow and Musical America’s 2018 Educator of the Year. Under the leadership of Mr. Núñez and Associate Artistic Director Elizabeth Núñez, the program has harnessed the power of music to fulfill the potential of children, heightening an awareness of the ability of children to rise to unforeseen levels of artistry. Over 1,700 children from ages 8 to 18 participate annually in YPC through its after-school, in-school, and community programs. YPC is a recipient of the National Arts and Humanities Youth Program Award, America’s highest honor for youth programs. For more information, visit ypc.org. The Cathedral of St. John the Divine is the Cathedral of the Episcopal Diocese of New York. It is chartered as a house of prayer for all people and a unifying center of intellectual light and leadership. People from many faiths and communities worship together in services held more than 30 times a week; the soup kitchen serves roughly 25,000 meals annually; social service outreach has an increasingly varied roster of programs; the distinguished Cathedral School prepares young students to be future leaders; Adults and Children in Trust, the renowned preschool, after school, and summer program, offers diverse educational and nurturing experiences; the outstanding Textile Conservation Lab preserves world treasures; concerts, exhibitions, performances and civic gatherings allow conversation, celebration, reflection and remembrance—such is the joyfully busy life of this beloved and venerated Cathedral. For more information, visit stjohndivine.org. YPC’s programs are supported, in part, by public funds from the New York City Department of Cultural Affairs in partnership with the City Council and City Council Members Margaret Chin, Helen Rosenthal, and Eric Ulrich; the National Endowment for the Arts; the New York City Department of Youth and Community Development’s Council Discretionary Fund, and New York City Council Members Daniel R. Garodnick, Barry Grodenchik, Corey Johnson, Ben Kallos, Ydanis Rodriguez, Helen Rosenthal and Helen Rosenthal; the New York City Department of Education; the New York State Council on the Arts, with the support of Governor Andrew Cuomo and the New York State Legislature. Saturday, June 2 at 7:30 p.m.